Director Frank Lloyd is virtually forgotten today, his epic style and passionate narrative sense well out of fashion, and yet he was responsible for such Oscar-winning movies as The Divine Lady (1929), Cavalcade (1933) and Mutiny on the Bounty (1935). 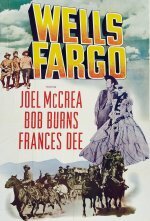 This is the story of America's famous freight carrier, which unfolds as we follow the screen marriage of leads Joel McCrea and Francis Dee - actually a married couple in real life - and, regrettably, their complicated relationship gets in the way of the truly epic saga of Wells Fargo itself. This was McCrea's first substantial leading role, and he stoically underplays in the style of the great silent western stars. Nevertheless, this is stirring entertainment on a grand scale, and if it looks familiar that's probably because Paramount kept recycling the action sequences, most notably in Geronimo two years later. Note this is the 95 minute version and not the full 115m that premiered in New York.